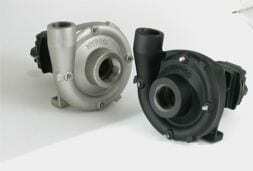 In keeping with Flojet’s commitment to ongoing product improvement there have been some recently implemented changes to the 4000 series Quad pump product range. There is no concerns for existing applications and installations as these improvements will improve pump functionality. Recent engineering developments have allowed the elimination of the fan cooled (TEFC) motor on the Flojet range of 12 and 24 volt DC range. The newly designed motor (TENV) is approximately 20 mm longer than the old motor and has improved duty cycles than the older (TEFC) motor. The new motor design incorporates a sealed rear end cover to protect it from the environment, up to 25% longer life on the motor brushes and a higher overall motor efficiency. The motor change will not affect the pumps flow and pressure performance. Models affected include 4100-505, 4300-142, 4300-143, 4300-504 and 4300-506. As this is a running change Pumps and Sprays will continue to run out the older fan cooled product and the new TENV stock will be phased in as stocks are replaced.